Cancer – a single word that many dread, but far too many hear. Defined as when abnormal cells divide uncontrollably and destroy body tissue, cancer comes in more than 100 different forms. At Woman’s, we are improving the level of care cancer patients receive through providing the best possible care and the best possible team. 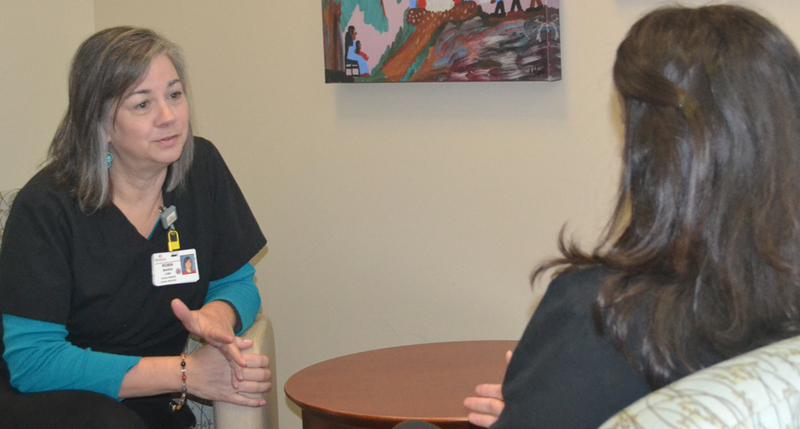 Robin Maggio is an Oncology Social Worker who has been with Woman’s for nearly 25 years. In a recent Q&A, Robin shares more about what she does to improve the level of care Woman’s provides. A: My daily activities vary. While some days are more like others, it changes based on my priority list. More often than not, my day involves seeing patients when they need me most, whether that be in the hospital or Infusion Center, I’m where they need me to be. Somewhere in between, you can find me in meetings discussing policy and procedure or planning an upcoming event, or at my desk answering phone calls and doing follow-up contacts. It’s really something different every day! Q: How does your role help patients? A: I believe that when someone hears, “you have cancer,” it can shake them up. I am here to provide overall support and help them find a way to cope with their new diagnosis. I often help patients manage the impact their treatment has on their life and the lives of their family. In addition, I help them sort out how their treatment may affect their job and other responsibilities they may have. Q: How many patients do you typically see and assist? A: I often follow the same patients throughout their entire cancer journey. An estimate may be 25 to 30 patients a week. But like my days, the number of patients I see changes constantly. I try to ensure that I see my patients when they need me most, whether that is when they’re feeling at their worst or when they’re celebrating being discharged. Q: Describe your position in one or two words. Q: What makes your job special? A: My job is special to me because I get to know and see people during what can only be described as one of the most difficult times in their lives. Being able to be there for them and provide the care and support they need is hard to explain, but so special to me. I also think my job is special because I get to work with other professionals who truly love their patients and patients’ families and who all want to help them achieve their goals of health and well-being. Q: What would be your most memorable moment of your job? A: In my position, like I’ve said before, I’m often with patients during some of the most difficult and challenging times of their lives. There are no words to explain the feeling you get when you have a patient who has heard, “It worked! No more treatment!” But something that has been particularly touching to me is when a patient told me, “I want to thank you for changing not only my life, but also the lives of my family.” Those words are special. And that’s something that means the world to me. Q: What do you think makes Woman’s special? A: At Woman’s, we focus on specific types of cancer, which allows us to be “the experts” at what we do. That’s something not many other places can say and what helps separate us from the rest. Q: What is your hope for Woman’s within 10 years? A: In 10 years, I truly hope that we can accomplish our dream of a comprehensive cancer care facility and really set the standard for cancer care. Q: How can we make that happen? A: We can accomplish that goal by thinking ahead and staying ahead of the curve. Cancer treatment has changed so much over my time at Woman’s based on research and new technology, so by being open to new methods and new ways, we can continue to raise the level of care we provide. Robin is one of the many Woman’s employees who believe in our mission “to improve the health of women and infants” and practice it daily. To support that mission and continue to improve the care that Woman’s provides, click here.